Getting certified is just as important to the career of a medical biller as it is to a coder. This video will share the benefits of being certified and how to go about doing it. Certification is not a requirement, but professional medical billers will find that certification leads to more job opportunities, better pay, and more chances for significant career advancement. We’ll break down the different medical certifications by the organization that grants them. For the sake of brevity, we’ll cover the two largest certifying organizations in medical billing, the American Medical Billing Association (AMBA) and the American Association of Professional Coders (AAPC). We’ll start with the AMBA. 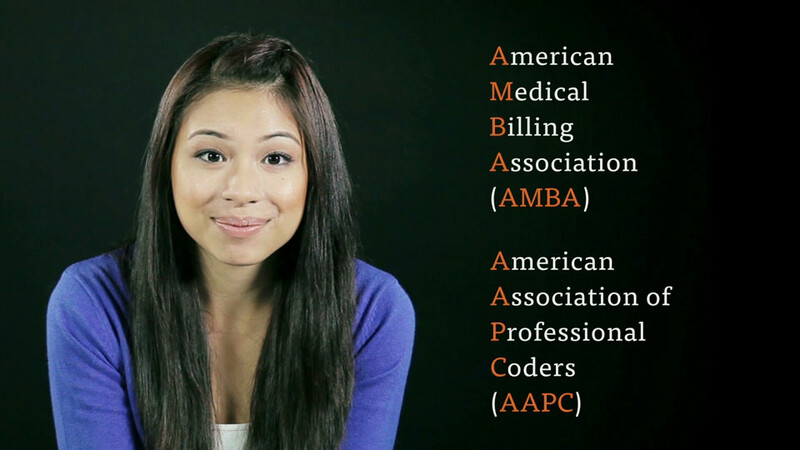 The AMBA is a professional organization dedicated entirely to the medical billing field. The AMBA has been certifying medical billing professionals through their Certified Medical Reimbursement Specialist (CMRS) exam for over a decade. This exam, much like the CPC exam is a large, comprehensive exam that tests individuals on all phases of the medical billing process. Students must be a member of AMBA to take the exam. Membership in AMBA costs $99 annually. There are over 800 questions in this exam, and students must earn an 85% or higher to pass. Students take this exam online and have 45 days from sign-up to complete the exam. The CMRS exam is divided into sections. Upon completion of one section, the student’s grade will be available immediately. Comprehensive scores are also available immediately upon completion. Should you fail to score 85% or higher on the test, you are allowed two free retakes, with at least 30 (but no more than 60) days between retakes. In order to prepare for the exam, you can purchase the a CMRS study guide for $199 in the AMBA store. The CMRS recommends at least some experience in billing, or a very strong foundation in the practice, before you take the exam. You are also required to have a high school diploma or equivalent in order to take the class. You are allowed—and encouraged—to use the current publications for medical coding during the exam, including the CPT, ICD-10-CM, and HCPCS Level II coding manuals. Once you’ve passed your exam, you’ll need to maintain your certification. In order to do this, the AMBA requires you to complete 15 credits of continuing education each year, in addition to maintaining your annual membership. Continuing education credits includes classes available through AMBA, AMA, Cengage, and a number of other organizations. Continuing education credits through the AAPC, American Health Information Management Association (AHIMA), Practice Management Institute (PMI), and Medical Group Management Association (MGMA) are available for half-credit toward your continuing education credits. The full list of approved continuing education courses is available here: http://www.ambanet.net/ceu.pdf. As the largest organization of health information professionals, the American Association of Professional Coders focuses mainly on medical coding, but they do offer a medical billing certification. This certification, which is earned upon the completion of the Certified Professional Biller (CPB™) exam, tests the medical biller on every facet of the billing profession. Like the CPC™ discussed in Course 1-4, this certification is a rigorous but well-respected benchmark for professionals in the health information field. Unlike the CMRS exam, individuals taking the CPB™ exam must complete the test in one sitting. Students should bring their code books, which list ICD-10-CM, CPT, and HCPCS codes. Students must earn a 65% or higher in order to pass the exam. Refer to the eBook for a more detailed description of the CPB™ exam. Like the CMRS certification, individuals must pay for a membership in the sponsoring organization (in this case, the AAPC) and must demonstrate completion of a certain amount of continuing education courses in order to maintain their certification. For the CPB™, individuals must complete 36 units of continuing education every two years. Continuing education may take the form of seminars, online classes, meetings, training courses, and other forms of instruction. In order to get a full picture of what continuing education units are available, visit the AAPC’s Continuing Education Unit (CEU) page.